Upscale coastal lifestyle! 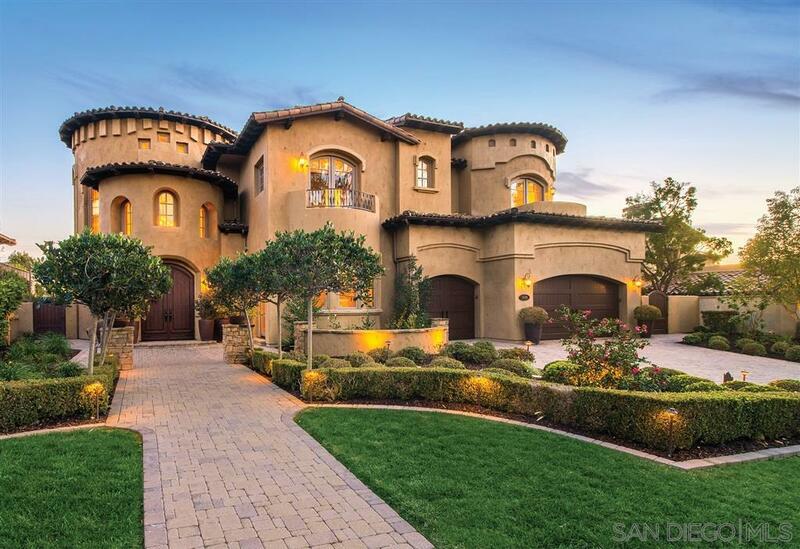 European-inspired estate overlooking 17th hole of Grand Del Mar golf course. Gourmet kitchen has top SS appliances and refreshed cabinets. Huge family rm offers built-in media center with surround sound. Ensuite bedroom & office on 1st floor. 2nd floor features master suite w/expansive panoramic views and luxurious master bath. Additionally 4 bedrooms and media room, perfect for large families. Fine outdoor living with sparkling pool/spa, BBQ, fireplace, artificial turf & more!, Welcome home to this refreshed European estate on a golf course view lot. Meticulously maintained, the large floor plan suits families of all sizes. The gourmet dream kitchen has top-of-the-line stainless steel appliances and refreshed cabinets. A massive U-shaped granite countertop is perfect for large gatherings. The spacious family room has a gorgeous marble fireplace and entertainment center with surround sound. Also on the 1st level is an ensuite bedroom and executive office with private entry. The sunny master retreat features an expansive balcony with panoramic views of the 17th hole and beyond of the Grand Del Mar golf course and luxurious, marble-accented master bath. Upstairs are 4 additional bedrooms and a large media room. The entertainer's backyard sparkles with a pool, raised spa, and waterfall, all surrounded by a fireplace, lounging areas, built-in barbecue, and artificial turf. Featuring views front and back, the home is well situated in this exclusive guard-gated community, close to the club house, resort, and restaurants.